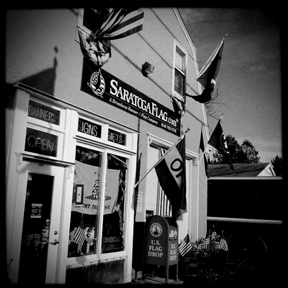 Saratoga Flag Company is located in the Old Gansevoort Firehouse on Route 32N at Route 50 in the Hamlet of Gansevoort, Saratoga County, NY. The shop is eight miles northeast of downtown Saratoga Springs, 10 miles north of Schuylerville, and eight miles South of South Glens Falls. Saratoga is 200 miles North of New York City and 200 miles South of Montreal, Canada. Closed Sundays & Mondays. All other times are by appointment.